A big thanks to Gradey Proctor as he leaves Bark to invest in his family and the growing Arctos School of Herbal and Botanical Studies, which he co-managed while at Bark. Our going away gift to Gradey? We’ll be investing even more time into protecting the Clackamas River from the 2,000-acre Jazz Timber Sale, which the Forest Service sold to Canadian timber giant Interfor last month. If you want to help, donate to our legal fund today. We are thrilled to welcome Michael Krochta as Bark’s new Forest Watch Coordinator. See Bark Tales below for more information on Michael’s work defending Mt. Hood. PS – Thanks to the 200 of you who joined us at last Tuesday’s Rally for Our Public Lands. Make sure to peruse the rally photos on our Facebook page. Bark’s Facebook page has nearly 1,000 likes! Help us reach that goal and ‘like’ Bark on Facebook now. Thursday, October 24th we are hosting a brand new training to help aspiring forest advocates fight and stop destructive projects on public lands. Forest Campaign Toolbox will delve into the ways in which legal tools, public process, and community organizing intersect and can lead to victories for Bark and other activists. This event is a part of Bark's Rad◦i◦cle Program, a series of trainings that aim to empower individuals with the right tools to defend the forest and other public lands. Rad◦i◦cle includes sessions in forest ecology, community organizing and public lands management policy. Visit our website to see a full list of trainings and learn more about the two Rad◦i◦cle training tracks, Forest Ecology and Organizing and Policy. RSVP to Meredith@bark-out.org for Forest Campaign Toolbox now. The most popular Bark-About of the year is back! 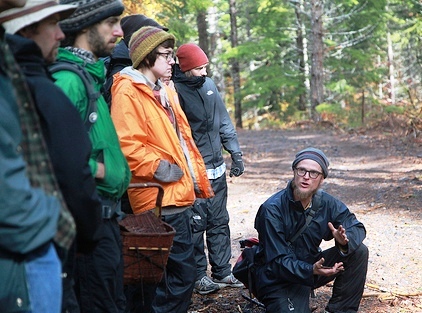 October’s hike will be led by Mushroom Mark who will guide us through the forest to learn about the vital role our mycelial allies play in the ecosystem. With the autumn rains well under way, it’s a great fall for fungi and we expect to see a lot of mushrooms on our hike! As this is the most well attended hike of the year, please preregister. Email Michael@bark-out.org, or call 503-331-0374 to RSVP. 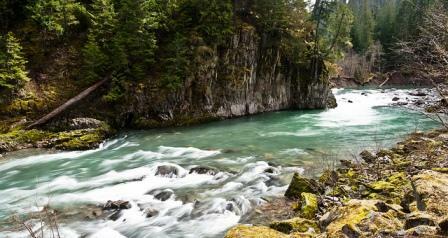 You should expect to walk up to two miles off trail on this month's hike. If you'd like to bring home some edible mushrooms bring a knife, basket, and paper bags. Please also bring lunch, water, sturdy boots, warm layers, and waterproof gear. Bark-Abouts are led on the second Sunday of every month and are free to the public. Click here for more information about this month’s hike. Sarah Leoni, board chair of Modified Style Portland, recently asked for my thoughts about Bark receiving the proceeds from this year’s runway show. My answer was that people think of fashion and environmentalism both as things that someone else does. I can only imagine that this is a big reason why the environment only receives 2% of all philanthropic gifts in the United States. Mt. Hood can afford for you to let someone else be fashionable, but our forests need YOU to show up. Please donate today. We recently welcomed longtime volunteer Michael Krochta as our new Forest Watch Coordinator. Michael got involved with Bark in 2011. He began as a volunteer groundtruther, later becoming a member of the Forest Watch Committee, and then played a crucial role in developing and refining our BMP2 program (Bark’s Monitoring Program for Best Management Practices) that has mobilized Barkers to measure the impact logging has on the forest, including soil and water quality. Bark has a strong history of training and empowering individuals to move into leadership roles protecting Mt. Hood and beyond. If you are interested in getting involved in this work check out the array of forest ecology and policy classes in our Rad◦i◦cle training program. A big howl is due to outgoing Forest Watch Coordinator Gradey Proctor (pictured left, in his element, giving a training), who has been a dedicated Barker for the past decade. Gradey’s contributions to the organization have been huge and long lasting: over the years he’s been a volunteer, Forest Watch Committee member, served on the Board of Directors, and eventually became a staff member. Thanks, Gradey! HAAAAAAAAOOOOOOOOOOOOOOOOOOO! The first time we set boots on the ground in the Jazz Timber Sale, we knew we were ready to dig in and fight the proposed 2,000 acre logging project in Mt. Hood’s Clackamas District. That was back in 2010, and we have continued to challenge the Forest Service on the timber sale at every step of the way. After multiple failed appeals, a temporary withdrawal of the timber sale in early 2013 by then Forest Supervisor Chris Worth, and a reintroduction of a ‘zombie’ Jazz Timber Sale with essentially no changes made to address our concerns, Bark initiated a lawsuit against the Forest Service, filing our complaint in July of 2013. Our active litigation does not mean that the Jazz Timber Sale is halted, however, and in the absence of a court injunction the Forest Service has continued to move Jazz closer and closer to the chopping block. In September the agency put two areas of Jazz, (named ‘Bass’ and ‘Drum’) up for auction. The Canadian based timber company Interfor was the one and only bidder on this sale, and will likely be awarded the contract to log this forest. 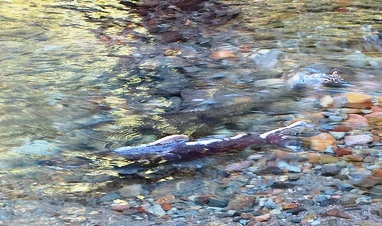 Bright red bodies glinting in the sun signal the return of adult Coho salmon to their natal river or creek in the Mt. Hood National Forest. Water levels rise in response to autumn rains and fish seek suitable spawning areas. Hikers on September’s Bark About were lucky enough to witness this as salmon returned to their home in the Sandy River basin last month. Coho runs in the Sandy and Clackamas river basins have benefited from habitat restoration projects completed by the Forest Service, partners, and conservation groups during the past decade. 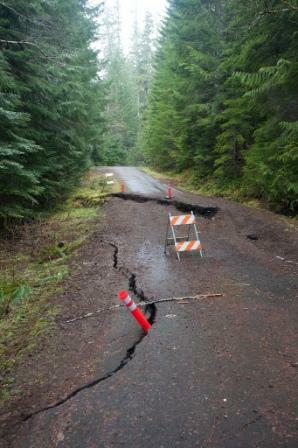 Despite amazing restoration work done in streams and rivers, one of the biggest barriers to the recovery of Coho and other salmon populations is not in waterways at all, but is the many miles of inadequately maintained roads throughout Mt. Hood National Forest. As funding for road maintenance declines, the Forest Service simply cannot maintain its huge road network, totaling 3,500 miles forest wide. Severe winter storms can wash out culverts, with the resulting sedimentation smothering salmon eggs and setting back fish recovery. When the Mt. Hood National Forest begins its Travel Analysis Process this year you’ll have a chance to tell the Forest Service which roads are needed for recreation access and which old logging roads must be removed to reduce maintenance costs and environmental risks. Bark will be working to actively engage you in this process soon so stay tuned for updates, or contact Meredith@bark-out.org for more information on efforts to restore Mt. Hood by decommissioning deteriorating roads.